In WizeHive terminology, People are users that you invite into your Workspace to share information with or to designate as external judges or reviewers. You can invite as many people to the Workspace as you need. Each person must be assigned a status. For information on the types of users, view Types of Users. Additionally, if you need to add a judge to your Workspace, consider them as part of your usergroup. Normally judges are added as “limited” members so that they are “limited” to the entries they can review or judge. They will be limited based on the assignments you give to them. See the Assignments reading for more information on Assignments. To add people, go to the People tab and click the green ‘Add People’ button. System generated invitation – most commonly used to add an Administrator. 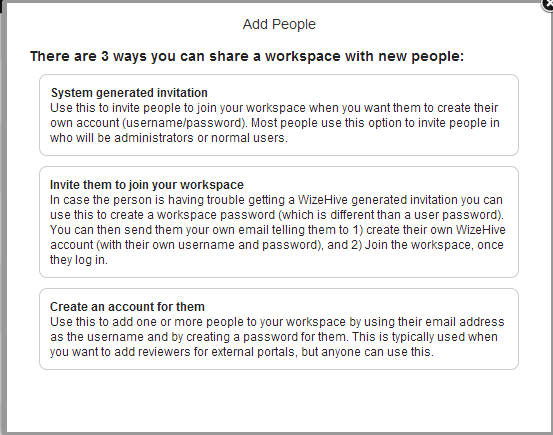 Invite them to join your Workspace - In case the person is having trouble getting a WizeHive generated invitation. Create an account for them – generally used to create judges' accounts. To DELETE a user, see the Actions Section. System Generated Invitation: Use this to invite people to join your Workspace when you want them to create their own account (username/password), or use an existing account. They will receive a system generated email with a link to sign in or create an account at WizeHive. 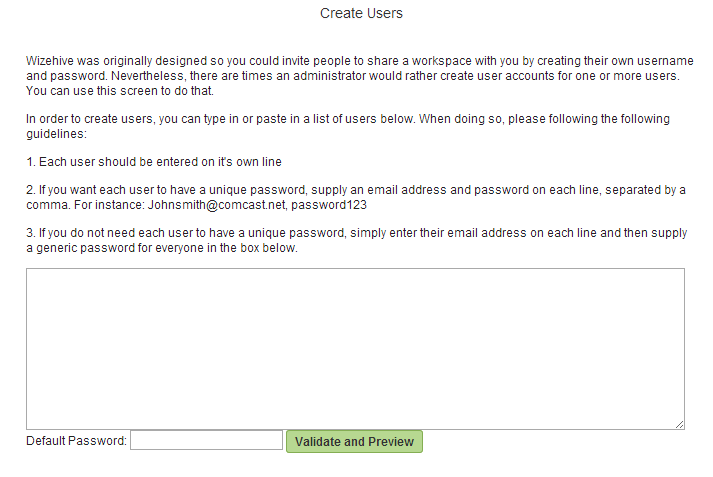 Most people use this option to invite people to the Workspace who will be administrators or normal users. You can easily set the person's Workspace access (type of user) through this screen by setting their user type to: an Administrator, Full Member, or Limited Member, or Strictly Limited Member. To invite members, enter their email addresses separated by commas and select their access. You also have the option to add a personal not in the invitation email. An Owner can delete the Workspace. When the owner changes the order of tabs in the Workspace, the order is changed for all people. They have all the permissions listed below for other users. An Administrator has full access to the back-end of WizeHive and can change the order of tabs in the Workspace. They have all the permissions listed below for other users. A Full Member can move entries and see all entries, regardless of Assignments. They cannot edit the form or make changes to entries. A Limited Member has access only to those entries that they have been assigned Privileges and Assignments to see. A Strict Limited Member has access only to those entries that they have been assigned privileges to see and they are not able to view notes between other users. Invite them to join your Workspace: You can then send them your own email telling them to 1) create their own WizeHive account (with their own username and password), and 2) join the Workspace once they log in. The system will generate a password to enter the Workspace. Thus, when the invitee enters the Workspace, they will have to provide the password to join. This is the least common way to invite someone into your Workspace. Create an account for them: Use this feature to add one or more persons to your Workspace by using their email address as the username and creating a password for them. You can add multiple people at once, and assign one default password to all of them or create individual passwords. This is typically used when you want to add reviewers for external portals, but anyone can use this. If you use this option, the judge will not receive an email to notify them of the account. If there is no existing user with the email address entered, it will create an account for them with the password you specify. If a user account already exists with the email AND the user is only a limited member in a Workspace that has the same owner, then it will add them to this Workspace and update their password to what you have specified. It will also display a message like this: "The following user(s) were found to be limited users of a related Workspace, and we updated their password to reflect the new password. Please make sure they understand their password was updated for all Workspace." If a user account already exists with the email address, and the user is a administrator or full member of another non-related Workspaces, then it will add them to the Workspace, but not update their password. It should display a message like the following: "The following user(s) are already in WizeHive as a person or administrator of another Workspace (or as a limited user of an unrelated Workspace) and we were unable to update their password. This person will need to use their existing password or you will need to contact them to change their password to the one you were suggesting." You can assign someone a status of Type of User when you invite them to a Workspace initially and after they have joined the Workspace. To do this, go to the desired Workspace and select the People tab. Click on the Status of the person. 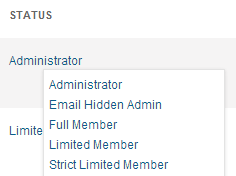 A dropdown will appear with the options: Administrator, Email Hidden Admin, Full Member, Limited Member, Strict Limited Member. Select the appropriate user status. Note that only a Workspace owner or administrator can make someone else an administrator. Delete: Will delete the person from the workspace. Admins and Owners must be converted to Limited Members before deletion. Under the Show option there is a "Groups" option. By selecting the green "Add Group" button and naming the group you can create a group and assign users to that group. Grouping can be helpful with assignments. It can be used to assign a folder of entries to a group of judges. For more information, see Groups.